Buoyed by stronger demand for pickup trucks and crossover vehicles, General Motors reported today that October sales increased 3.5% compared to a year ago. 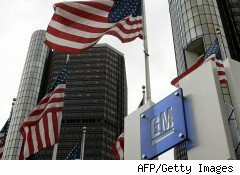 Excluding its discontinued brands, GM said sales of Buick, Cadillac, GMC and Chevrolet models rose 13% for the month. The results are yet one more indication that the U.S. auto industry enjoyed one of its strongest months of the year, despite the lackluster economy, which has many consumers wary of taking on additional debt. On Tuesday, several foreign automakers, including Hyundai Motors and Subaru, reported record sales for the month. "Our October results show that our focused plan is working, as our four brands continue to grow," said Don Johnson. GM's vice president of U.S. sales, in a statement. "Year-to-date sales for GM's four brands have increased 22% through October, while the industry has increased approximately 10.5%." For the month, the Detroit-based automaker sold 183,759 vehicles. By brand, GM said sales momentum was strongest at Buick, which sold 12,569 units and recorded a 39% gain compared to year ago. Cadillac sales rose 15.4%, for a total 13,393 vehicles. GMC sales climbed 30% to 33,136. And att Chevrolet, by far GM's largest division, sales rose 6.7% for a total of 124,294, due in part to continued strong demand for the Equinox small SUV. Automakers typically all report sales figures on the same day. But domestic automakers along with Toyota Motor (TM), Honda Motor (HMC) and Nissan Motors (NSANY) postponed release of sales figures in lieu of Tuesday's nationwide elections in the U.S. In a conference call with investors and the media after the release of Wednesday's monthly sales data, Johnson noted that by October's end, 85% of GM dealers' stock was 2011 models, compared to 49% a year ago for new 2010 models. In contrast, Johnson said many GM competitors are still carrying a larger percentage of 2010 vehicles. "This puts us in a good position to continue to grow by offering new-model-year vehicles without having to discount old inventory," he said. GM is also selling its cars at higher transaction prices and with fewer incentives than it did a year ago, Johnson said. Through October, GM spent about $3,250 in incentives for each vehicle sold. That's down $650 compared to the first 10 months of 2009. The company declined to take questions about its pending initial public offering of stock. GM is soon to begin a "road show" with investors, and analysts expect the stock to make its debut on Wall Street around Nov. 18.